Sometimes you need a book that makes you smile. 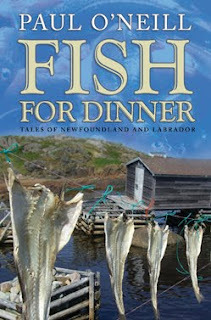 I was lucky enough to find Fish for Dinner by Paul O'Neill on display in the library. Even though I had an armload of books already, I took this one out too. I just couldn't resist a book where the author is compared to the Brothers Grimm. Fish for Dinner is a collection of stories written by Paul O'Neill but taken from the oral traditions and folklore from around the world. They are fables and fairy tales with a distinctive Newfoundland flavour. O'Neill has taken these tales peopled them with Newfoundland characters and placed them in Newfoundland settings. The result is magical and charming. The stories reflect the numerous cultures that have lived in Newfoundland and Labrador over thousands of years from the Paleo-Eskimo and Beothuk to the Irish and French. Among the stories you will find a pretty Inuit girl kidnapped by water spirits, a French girl in love with a tree and a Viking with a bad temper. Then there are the animal tales: a Newfoundland dog outwits a fox and a weasel finds a human wife. All whimsical tales. Although I was reminded of Hans Christian Andersen's stories as I read, O'Neill's tales are upbeat and happy. The good are rewarded and the bad are punished. That's not to say there is not some sadness, that's necessary in the some of the stories. I came away feeling that O'Neill succeeded in entertaining his audience in much the same way his father entertained him as a child. I did find that I enjoyed the stories at the beginning of the book more than the ones toward the end. I especially liked Fish for Dinner (of which the book takes it's title) where a captain turns into a fish and is nearly served up for dinner! 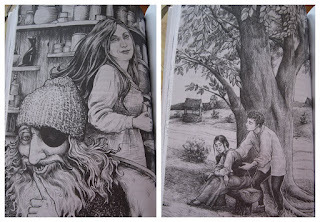 Each story is illustrated beautifully by Tara Fleming. They set the tone for the stories perfectly. If you love fairy tales and folklore, I highly recommend Fish for Dinner. You make the book sound delightful. I'm going to hunt this one down. thanks.